Published: Sept. 28, 2017 at 12:10 p.m. Updated: Sept. 28, 2017 at 01:14 p.m. It is often said that it's not how you start but how you finish that matters. However, getting on NFL scouts' radar early in the season allows prospects to get opportunities throughout the rest of the year, whether it's drawing a general manager to campus or earning a postseason all-star game invite. Here are 7 prospects who took full advantage of their chance at the spotlight in the first month of the 2017 season. 2017 stats: 73 carries for 787 yards (10.8 average), 5 TDs. 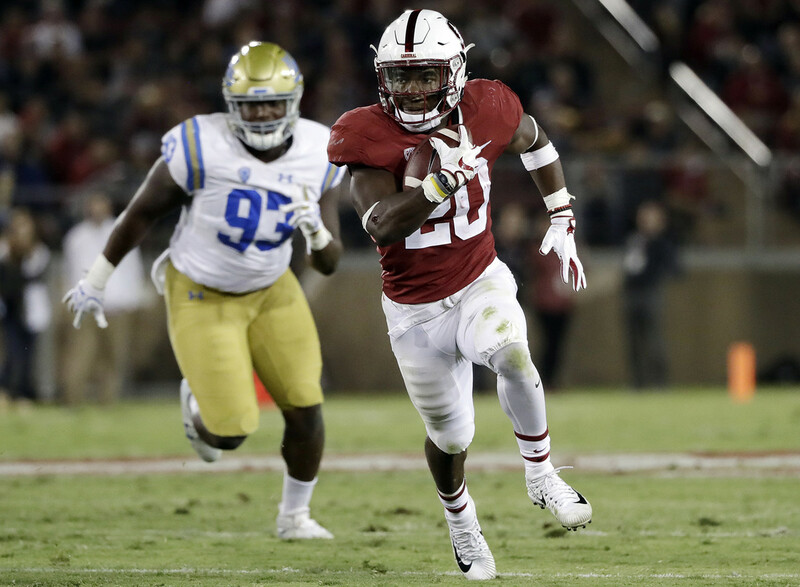 Two weeks ago, there was a Battle Royale between Love and another running back on the rise, San Diego State's Rashaad Penny, when the Aztecs faced Stanford. Penny-led SDSU won that game, but Love's overall skill set is putting him in the "elite" category. His blend of size and speed have allowed him to take over for Christian McCaffrey, at least as a rusher (he has just two catches for five yards so far this year). Love has used his top-notch burst and amazing open-field cuts to lead the nation with 196.8 rushing yards per game (Penny is second with 179). He's averaging a ridiculous 10.8 yards per attempt! He's now moved from a young talent with potential to a possible Heisman Trophy finalist. Mississippi State left tackle Martinas Rankin deserved to be praised for his play vs. Georgia last weekend, but scouts already knew that he's a probable first-round pick. Wynn, on the other hand, also played quite well on the blindside that night. At 6-2, 302 pounds (school measurements), he will have to move inside to guard, where he played last season, at the next level. Wynn possesses excellent strength and quickness off the ball, allowing him to open up holes for UGA's running back trio of Nick Chubb, Sony Michel and D'Andre Swift. Wynn deserves starter's grades and mid-round consideration in this class. 2017 stats: 11 tackles (2 for loss, including 1 sack), 8 pass breakups, 1 fumble recovered. Nwosu did not start in high school until his senior year, though he was playing behind Washington's Keishawn Bierria at Narbonne High in the Los Angeles area. Now, he's coming into his own in his second year as a starter with the Trojans, rushing the passer and racking up eight pass breakups, which is tied for the most in the country. Don't be surprised if his athleticism earns him top-75 grades come April. 2017 stats: 115 of 174 (66 percent) for 1,249 yards and 10 TDs, 1 INT. Right now, no one is spinning the ball better in college football than Benkert. Boise State found this out the hard way last weekend, as Virginia went into their place and put on a 42-23 beatdown, with Benkert completing 19 of 29 passes for 273 yards and three touchdowns. He's not been cavalier with the ball this season, either, throwing only one interception in 174 attempts. The East Carolina transfer has earned mid-round grades with his play so far, showing scouts starter traits with toughness in the pocket, touch over the top, and the timing and accuracy to move the team in the short passing game. 2017 stats: 9 tackles (3 for loss, including 1 sack), 2 INTs, 1 fumble forced, 1 fumble recovered, 8 kickoff returns for 349 yards (43.6 average), 2 TDs, 5 punt returns for 103 yards (20.6 average). No, there's no relationship between this Bronco and Hokies receiver Cam Phillips, who's No. 1 on this list. But they're both making their families proud with their play as seniors. Phillips had interceptions against USC (with three pass breakups) and Michigan State in the team's first two games of the season, giving him 11 for his career. NFL teams are impressed by his special-teams prowess, as well; Phillips is averaging more than 20 yards per punt return and an astounding 43 yards per kickoff return, with two scores in the first four games. 2017 stats: 8 tackles, 2 INTs, 7 pass breakups. With three seniors in the secondary (Chidobe Awuzie, Ahkello Witherspoon and Tedric Thompson) earning all-conference honors in 2016, this sophomore's play last season was a bit overlooked. It's not going unnoticed this year, though. He already has nine passes defensed, which ties for the FBS lead. He's intercepted two passes in the season's first month. At 6-foot-1, 190 pounds (school measurements), Oliver has decent size as well as good ball skills. He's a great athlete, as he participated in the heptathlon and decathlon for the Buffaloes' track and field squad the past two years. 2017 stats: 34 catches for 523 yards (15.4 average), 5 TDs. The nation's leader in receiving yards (523 through four games) has used his speed, toughness and ability to high-point the ball on his way to five scores, which is as many as he had in all of 2016. He and freshman quarterback Josh Jackson have combined to become one of the most dynamic duos in college football. Phillips, a senior, has worked himself into top-100 prospect territory in a receiver class without great depth.